What Makes an Effective Safety Professional? All three are necessary for an individual to be truly effective. This is the kind of person that people want to do things for, and they are able to effortlessly work as both a people manager and a process manager. Let’s look at these qualities in turn. Southern Company achieved a 94% accuracy rating in predicting the likelihood of injury on a project. While many people want to become leaders, the first step is to attain technical proficiency. This is necessary in order to have the respect of the employees you are leading. Management is mainly functional, whereas leadership is nearly exclusively psychological. Hence for this component, the safety professional is more concerned with the management side. Leaders may prefer answers to reports, but workers still must report on what they do, and management must insist on those reports. 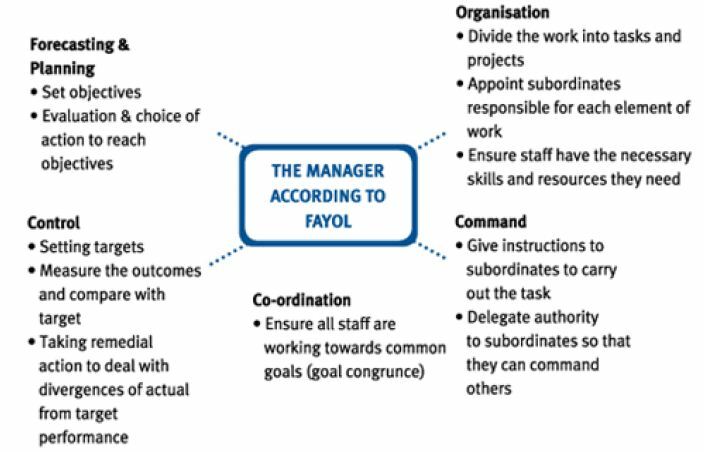 According to management theorist Henri Fayol, managers must forecast what needs doing; organize resources; and persuade others to do what is required by coordinating, commanding, and controlling them. These days, the concepts of command and control are somewhat old fashioned although they remain at the heart of management. These days, they are rebranded more like the ABC model (Antecedent, Behavior, and Consequence), where an antecedent triggers a behavior, bearing in mind a consequence. Furthermore, nowadays we should consider communication as its own category as it is an essential function in its own right. It would seem that Planning and Command and Control dominate. 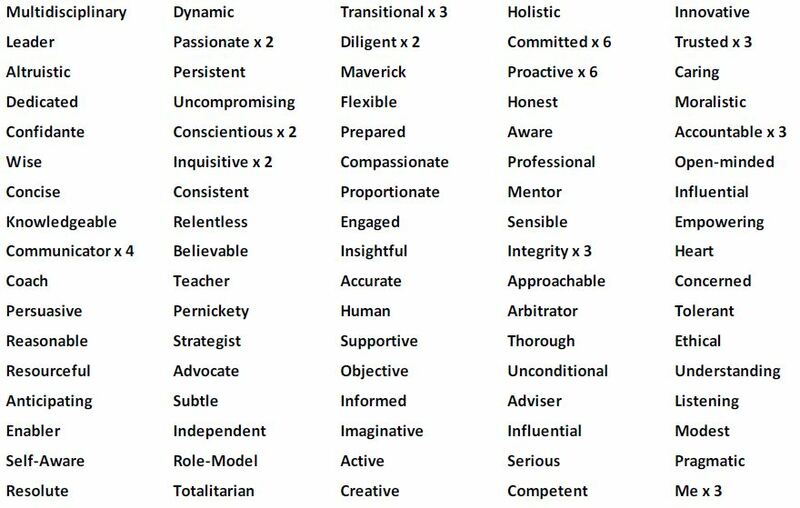 However, many of the suggested traits were actually character traits or borderline character traits. For example, certainly there is more to being approachable than just engaging in an exchange of dialogue. Can workplace injuries be predicted? Teamwork lies at the heart of any enterprise, and harkens back to our origins as a species. However, it was not until we unlocked the psychological means to both yoke individuals efforts and skills (cooperation), and preserve advances made within a group (culture), that our species began to make unparalleled leaps forward. Humans cooperate differently from all other social creatures. Unlike our closest primate relatives (Tomasello), our teams and groups are places where individual humans can specialize in one area or activity which they can then exchange for goods or services where others specialize. This raises the question of whether humans differ in innate abilities which predispose us to different ways of prospering in society, or do we acquire these qualities through our interactions within an evolved cultural system or meme (Nature or Nurture)? We tend believe these traits are learned, but studies of identical twins separated at birth demonstrate a clear genetic component. However, Michael Tomasello (The Cultural Origins of Human Cognition) believes that “The introduction of Darwinian ways of thinking… should have rendered this debate (Nature or Nurture) obsolete”. Furthermore, he hypothesizes that our ability to reason is largely dependent on the language we use to reason with (linguistic determinism). So, if the word ‘cause’ did not exist in the English language we would have to ask “how did trait X come about”, which would lead us to think differently about the process (indeed, it might also lead us to think differently about how accidents occur as well). Belbin draws on examples from real organizations, but the development of the model is based on specially selected subjects in the artificial environment of the business school exercise. Nevertheless, the traits from the LinkedIn poll were examined under Belbin’s nine team role characteristics, to see if there is a typical role that safety professionals might naturally fulfil within an organization. It would seem that safety professionals do not need to fulfill any one particular role. This contradicts an expectation that most effective safety professionals would be Monitor/Evaluators. It also seems safety professionals are least likely to be creative, imaginative or given to the generation of ideas that solve problems (Plants). That role might be the preserve of production line management, or it might reflect the fact that the Plant’s weaknesses, ignoring incidentals and not communicating well, are not conducive to being an effective safety professional. Resource Investigators did not feature prominently, either. These ‘safety cheerleaders’ are generally positive, well-meaning individuals who see their role as caring for all and trying to find a fair and happy compromise whenever there was tension between workers and management. However, that tension always existed, as management always sought to increase production and reduce costs while workers always tried to lighten their workload, improve their conditions and get extra pay. Often a compromise was impossible, as one side made the rules and the other side had to follow them. Either management said it has to be done this way or workers said we’re not doing that. This desire to avoid conflict meant that safety cheerleaders were only ever effective at getting worn machinery replaced or introducing a paperwork trail for insurance purposes. Their understanding of risk, safety and production was, for the most part, limited. Management never had to justify a risk to them because they were convinced management did all they possibly could to improve safety in the workplace. Safety was, therefore, just a case of workers being careful. 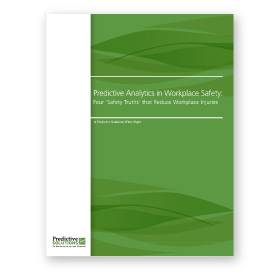 There was no question of calculations involving risk, reward, and loss where a worker’s safety was concerned. 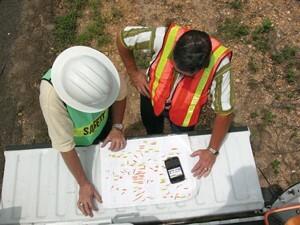 However, effective safety professionals are constantly involved in conflict. They hold people to account while recognizing good work. They make management understand that if they choose to accept a particular risk there is a likelihood an employee will get badly hurt. They also recognize some risks are necessary because the cost of removing them far outweighs the benefits. And other risks are unacceptable because the consequences to the employee and the company are unacceptable. Effective safety professionals make sure workers understand that the dichotomy is not immoral or illogical. The Shaper ended up at the top of the list, ironically, as those tend to be people who don’t compromise, driven by idealism. They can be just as ineffective as the safety cheerleader. The characteristics of the Shaper seem similar to many ineffective safety professionals who see themselves as moral crusaders, self-righteously struggling with inadequate resources to keep ignorant, obstinate, and reckless workers from harming themselves, while uncaring, arrogant, and deceitful managers hinder and obstruct them every step along the way. Meaningful dialogue was not possible; the only logical course of action to take was to humor them. These crusaders seemed to think they were the only ones seeing the world as it really was. And, though they were aware that their own background shaped their views and ideas (they frequently used anecdotes to justify themselves), they felt others’ backgrounds only helped to explain their biases or covert motivations. Moral crusaders also tended to treat risk takers disdainfully and seemed to believe the end justified the means. They also tended to believe all accidents could be prevented as a function of good management and worker compliance, without taking randomness into consideration. This displayed little or no understanding of risk, which must be confronted by any company operating in a competitive commercial environment. Risk, of course, is a function of mathematical probability. Sooner or later a risk will realize its potential to cause harm, which is characteristic of any risk. Effective safety professionals help manage these unwanted events. Moral crusaders will hide of their own volition, or are kept in the dark by production line supervisors, or are simply ignored. Moral crusaders also care deeply about their job and the workers facing danger at work. They tended to be idealists not seeing gray areas. They also tended not to understand that certainty is unlikely; and all risk cannot, indeed should not, be removed from human endeavor. Idealists often don’t want to hear opposing views and they don’t compromise, making it impossible to find common ground and less than pragmatic. 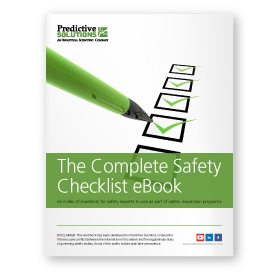 An index of checklists for safety experts to use as part of safety inspection programs. Returning to the LinkedIn poll, most responses were character orientated (Persistent, Inquisitive etc.). And of these, most were moral judgments (Trustworthy, Conscientious, etc.). However, character and morality are difficult concepts to pin down. Character in particular is hard to define, including where it comes from and why it is valued. Ernest Hemmingway defined it as “grace under pressure”, but that does not capture its essence. And character is not just about courage; although courage is a vital component. Character is a propensity to do what is right when the alternative is to do what is easy. But what is right is not always apparent. And there may be two conflicting rights, neither of which is easy. It seems a prerequisite of character is the ability to make good moral judgments about what is right. And there are only three ways to make those judgments. Something can be known, or felt, intuitively, but this leads to naïve realism, where somebody believes they see the world as it really is and everyone else should conform to their point of view (moral crusader). Hence if I see the world as it really is and believe the facts are there for all to see, it follows that those who disagree must be biased or willfully ignoring those facts. What is right can be learned from others, by following an established convention. This allows people to think there is a transcendent moral order, or orthodoxy, to which we ought to conform the ways of society (safety cheerleader). These conventions can be political (communism), legal (declaration of rights), religious (sharia law), or all three (Health and Safety). One can use logic and rationality as was proposed by those who developed the ideas that led to the Age of Enlightenment, following in the tradition of Plato, Aristotle, and Socrates. But this results in a cold, calculating and ultimately futile attempt to weigh intangibles to establish which has the greater utility (cubicle dwelling, metric fixated, safety manager). It also undermines the benefits of established authority, belief, and wisdom. People with character do not use just one of these methods to establish what is right; they use all of them simultaneously. Their moral core supplies them with intuition, to which their reasoning apparatus applies knowledge/experience and logic. These mechanisms do not operate independently; they have a dynamic reciprocal interaction. Through reflection and experience their intuitions become better. Their central moral core operates alongside an ability to see things from other people’s perspective. This allows them to appreciate that others may espouse sincere views based on deeply felt and honestly held values that may well differ considerably from one’s own viewpoint. This understanding allows them to balance in their minds between what is best for society and what is best for the individuals composing it. They understand that no single individual has all the answers, and there is seldom an orthodoxy applicable to all. They don’t tend to see the world in terms of simplistic binary opposites (no gray areas) either, and, they feel compelled to resist that mindset. In this context, character is not always elegant; it involves conflict. Good moral judgment, then, is the foundation on which everything else is built in this vision of character. Anyone wishing to rise above the ordinary must follow a more difficult path. They must possess or acquire a moral core and utilize all three elements of good judgment. Then they must be willing and able to apply that judgment in an environment which may not be conducive or receptive to their efforts. Fortunately, such a person will probably find the challenge presented to be rewarding. Moral character is vital for anyone wanting to be an effective safety professional. But where does moral character originate? How did it come about? The single greatest event in human evolution, according to Michael Tomasello in ‘The Cultural Origins of Human Cognition’, happened when the first primates began cooperating with what Tomasello calls ‘shared intentionality’. Essentially, one primate began to see other primates as an intentional agent like the self (leading to the evolution of language, tools, culture etc.). But for humans to take full advantage of this development, an entire psychology of cooperation must have arisen to encourage it. For it to flourish and evolve further as it did these traits must have helped it considerably. We developed a conscience to keep us from straying into selfish territory; feeling guilt puts a brake on our appetites; empathy helps us appreciate the needs of others so we can lend assistance and reduce any tendency to harm others; shame motivates us to put things right; and dispositions to be kind and generous build reputations and attract allies. 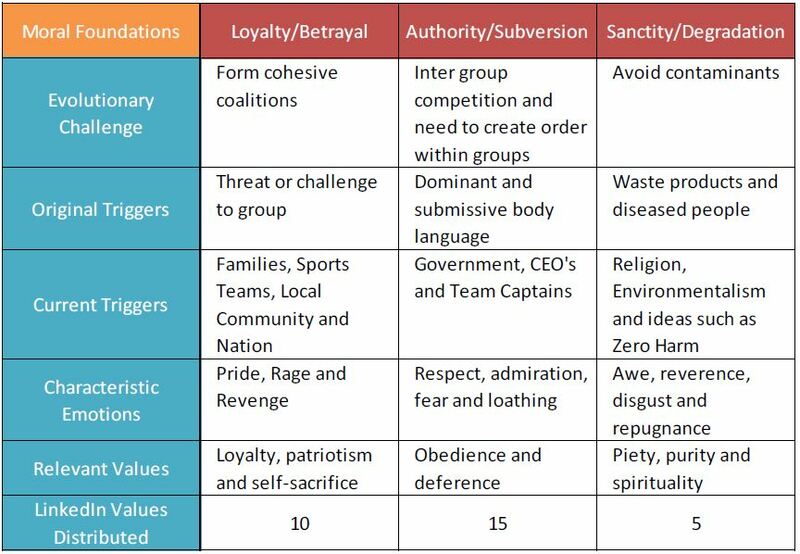 These attributes, or moral matrices (Haidt, ‘The Righteous Mind’), undoubtedly helped create highly cohesive and extremely cooperative groups. Darwin believed that cohesive groups will always out-compete other more individualistic collections of people for scarce resources. Moral matrices bind people together better than anything else. But moral matrices also blind people to the existence of other matrices. Human beings by design believe there is only one true and correct way of looking at any given situation (see Asch’s conformity experiments). If a group has an established way of doing something it is more beneficial to the group, from an evolutionary perspective, that everybody is committed to this than to approach a problem with a more efficient solution but in a disorganized fashion. This makes it difficult for people to consider there may more than one form of moral truth, or more than one valid framework for judging success or failure in society. It may explain the scarcity of character in highly cohesive societies. We have innate evolved intuitions but must adapt them to the culture we find ourselves in, a culture which is also evolving. “We are born to be righteous, but we have to learn what, exactly, people like us should be righteous about,” Jonathan Haidt, ‘The Righteous Mind’. Different cultures also favor different elements within the moral domain. Richard Shweder developed a three part model of morality based on three ethics; autonomy, community, and divinity. People favoring autonomy place the rights of individuals above all else; those favoring community give priority to the needs of the many rather than the needs of the few; and people prioritizing divinity see humans as a sacred vessel for the soul which must not be degraded or dishonored (which extends to a concept of purity, pollution and environmentalism). Per Haidt, the WEIRDer (western, educated, industrialized, rich and democratic) you are, the more you see a world full of autonomous objects, rather than relationships. Haidt does not say it, and it would change the word to WEIRDUr, but you could add Urban to that mix. Most other societies, though, build their cultures around the other two ethics. Because we simultaneously evolved as individuals within the collective we are compelled to further our own self-interest while presenting the best possible appearance of propriety to the group. Good moral judgment must traverse the chasm between what is best for the individual and what is best for society. Individuals also have their own moral compasses. Although, as Haidt discovered after extensive research, it is more like a palate with taste receptors than a compass. Some of the settings are high in some people and low in others. Morality is not easily changed, so Haidt suggests that just as we have taste receptors for salt, sweet, bitter, and so on, we have six basic moral receptors: caring, fairness, liberty, loyalty, authority and sanctity. See: http://righteousmind.com/ and http://www.yourmorals.org/. While all of us are born with a certain proclivity towards settings on these six moral foundations, each one is amplified, quieted, or modified by several internal and external factors. The internal factors include our personality and its development; external factors include the environment in which we are raised (culture, etc. ), and our own particular experiences. These factors act together in a dynamic reciprocal relationship along the lines suggested by Albert Bandura’s social cognitive theory (http://en.wikipedia.org/wiki/Social_cognitive_theory). Next, the LinkedIn poll is examined under Haidt’s six moral foundations, to see if there is a typical moral imperative for an effective safety professional. In his book ‘The Righteous Mind’, Professor Jonathan Haidt of New York University’s Stern School of Business suggests six basic moral foundations: caring, fairness, liberty, loyalty, authority and sanctity. For example, most people, with the exception of psychopaths who reason but don’t feel, instinctively respond to signs of suffering in their children. Because our brains are essentially pattern recognizers, the response generates whenever we encounter something similar to that trigger. The set of current triggers for any element of the moral matrix can, therefore, be much larger than the set of original triggers. Even a cute toy or a picture of a baby seal or kitten can trigger an instinctive reaction to care. 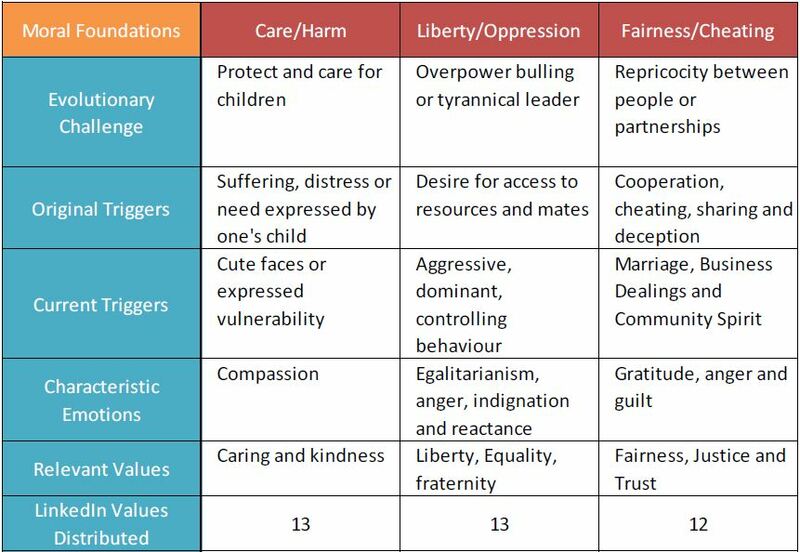 Each of these positive values is opposed by a negative related value, and each moral setting for an individual will lie within a range somewhere between the two extremes. Where we are within that range is then influenced by personal and environmental factors. The opposite of the ‘care’ value is ‘harm’. Our setting lies between a predisposition to care for our fellow humans and our propensity to do them harm. This is adapted to the environment we find ourselves in, but also affected by personal factors, such as what psychologist Dan McAdams refers to as the three levels of personality (http://www.psychologytoday.com/blog/the-personality-analyst/201011/three-levels-knowing-person). This works smoothly for most people as the challenges of daily living do not present too much difficulty. It is only when we step outside our natural range due to circumstances beyond our control (wartime, poverty, abusive households etc.) that people struggle. Sometimes two moral foundations can push us in different directions, creating dissonance. For instance, a soldier’s loyalty and authority foundation might cause him to do something that his care/harm foundation finds objectionable. This can lead to terrible feelings of guilt or trauma. Next, Haidt’s theory was applied to the LinkedIn poll. The almost uniform scores suggest there isn’t a specific moral foundation for an effective safety professional. The care/harm foundation unexpectedly did not come out on top, even though it may seem logical that many safety professionals would have entered into the profession because of their desire to protect and care for their fellow workers. Indeed, effective safety professionals often act as honest brokers or guardians of a company’s duty of care to workers so that management can understand the workers’ point of view. Many company managers do not know anyone working in the riskiest areas of the organization. These managers can be completely disconnected from the reality on the ground and not begin to appreciate what the term hazard actually means. Effective safety professionals help managers understand the concept that intangible representations of hazards on lists translate into real sources of pain for people. The authority foundation came out well ahead of all the others (tying in with Belbin’s ‘Shaper’). The effective safety professional may well be predisposed to being one of the safety police. These individuals start out as moral crusaders, but become disillusioned at some point, abandon the crusade, and revert to creating and implementing rules and regulations. Violations of these rules result in severe sanctions. Safety is paramount after all, so the rules or sanctions are justified as being for everyone’s own good. The ABC model (antecedent-behavior-consequence) suggests that behaviors are triggered by antecedent stimuli and motivated by consequences. This is a simplistic view of human behavior considering the human brain, essentially, as a conscious data processor. People are more complicated than that, and most of our decision making occurs at a subconscious level by an emotional mind, motivated by abstract ideas that may or may not take account of consequences. Consequences are most effective when they are soon, certain and positive. However, safety police operate differently; workers know it is really the negative consequences (which do not need to be either soon or certain) which will be used to manipulate their behavior. This is the old command and control model remarketed and rebranded. The tables do not help discern which moral values are necessary in an Effective Safety Professional. It remains an elusive confluence of characteristics. One way to view the responses to the LinkedIn poll, that requires no interpretation at all, is as virtue ethics. Per Jonathan Haidt in his book ‘The Righteous Mind’, in all of the world’s great civilizations, moral instruction took the form of stories about cultural heroes exemplifying certain virtues. More formal philosophy often included an analysis of the virtues extolled in the stories and suggested that these virtues should be cultivated as a set of habits, character traits, and practical skills to be mastered over many years. Virtues were also role-specific; each person plays a part in several systems from family up through nation and a virtuous person must learn how to play the parts well. Virtues, like most things, can be defined by what they are (abstract) or by what they do (functional), but most approaches favor the latter method and treat them as character traits a person needs to live a good, praiseworthy life. Haidt contends the mind is like a rider (conscious controlled processes; Kanneman’s system 2) on an elephant (unconscious automatic processes; Kahneman’s system 1); only virtue ethics will address the whole mind. Virtues are excellences of character helping people play their roles in society. There are many roles and kinds of interaction, so there are many virtues. Virtue theories are pluralistic—they can’t be reduced to a single master virtue. Just as the right education, habits, influences, examples, etc. can promote the development of virtue, the wrong influencing factors can promote vice. Indeed, the use of the term professional should denote something intrinsically difficult. Professional advice is only sought when faced with a difficult situation requiring expertise. The purpose of a professional qualification has always been to turn raw recruits into capable, well rounded people with expertise not easily acquired or applied. A professional aspires to a high level of competence or skill for which they are paid; an amateur is a dabbler displaying less competence or skill and is unpaid. Professionals establish the standards, values and identity of a profession, eliminating those who do not possess the aptitude, intelligence or dedication to reach those standards. It is not enough to produce individuals capable of passing demanding examinations. The ultimate aim must be to produce people who can exert discretionary judgment. The latitude to make decisions based on their own assessment of a situation, utilizing all the elements of good moral judgment, distinguishes a true professional from a charlatan. This requires an ability to evaluate, think systematically and generate alternatives to complex problems, often involving ethical concerns that affect the general public. Responsibility is notable by its absence from the list above. Accountability comes close, but a person can be held accountable for something for which they had no real responsibility. It could be argued that line management are the ones responsible for safety, as they are the ones who must ultimately balance production and safety. However, this does not entirely get the safety professional off the hook. They still have a responsibility to advise and monitor line management. Accepting responsibility is not something that comes naturally. Responsibility must be learned, and it can only be learned through experience. Seeking responsibility is the most important virtue an Effective Safety Professional must acquire. And, as with all virtues, this will only come about through practice, reflection, development, implementation and further reflection. Liam has worked on construction sites in the US, UK and Ireland, and spent over 17 years working as a skilled butcher for a meat processor while continuing to run his family’s farm. Following the closure of the processing plant, Liam returned to college where he obtained a First Class Honours Degree in Construction Management, and went on to work as a Site Engineer for a construction company. Liam became interested in Health and Safety when he wrote a thesis, The Effect of Group Dynamics on Safety Culture, for his Honours Degree qualification and subsequently went on to gain a post graduate qualification on the topic from Trinity College Dublin.